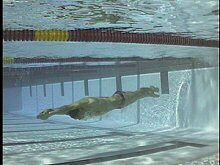 Michael Phelps demonstrates the difficult crossover or modified roll turn from backstroke, the following breaststroke pullout and the breakout. Before the rule change that allowed a rollover turn on backstroke, the modified roll turn was the quickest way to turn from backstroke to breaststroke in the IM. However, this turn has not faded into technique history as “what we used to do before they changed the rule.” Many elite athletes continue to use this turn during IM transitions from back to breast. 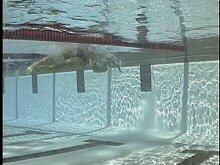 In this article, we will be taking an underwater view of this difficult turn, the following breaststroke pullout and the breakout. Not only will we have a fish-eye view of the turn, but it will be demonstrated by the best IM swimmer in the world, Michael Phelps. Swim into the wall the same way you would approach the wall for a backstroke flip turn. 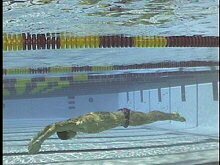 Your distance from the wall when you initiate the turn should be slightly less than it is for your normal backstroke turn. This may require you to lengthen your last several stroke cycles slightly in order to get yourself closer to the wall (Photo #1). 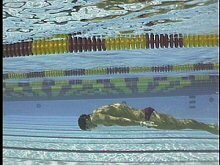 On the last arm stroke, instead of rolling over onto the chest, your body will roll halfway onto the chest so that you are perpendicular to the bottom of the pool, with your chest facing the lane line. Your last arm stroke (Michael’s right arm) will reach behind your head (Photo #2). Drive into the wall, bringing your hand and forearm behind your head. During this final moment before you make contact with the wall, you must be careful not to let your shoulders pass vertical (which would be illegal). Plant your hand fairly deep on the wall, just behind your opposite shoulder (Michael’s left shoulder). Your fingers will be pointed down and behind you (if the wall were a clock, Michael’s fingers would be pointed at 7 o’clock), with the palm of your hand flat on the wall (Photo #3). Once your hand is on the wall, continue to roll onto your stomach and somersault. 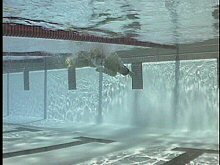 Bring your other arm (the one that did not touch the wall; Michael’s left) down toward the bottom of the pool, which will help you to bring your body into alignment and stop you from flipping too far (Photo #4). Roll onto your side‹not all the way onto your stomach‹as your feet come in contact with the wall. Your feet should be relatively high on the wall, fairly close to the surface, and your toes should be pointed parallel to the surface. Bring your arm that came in contact with the wall overhead to meet your other arm so that you can get ready to push and streamline (Photo #5). 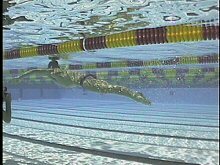 Push off on your side with your eyes looking toward the side of the pool, tightening your streamline as your legs straighten. Streamline with your elbows close together behind your head and your torso flexed and straight (Photo #6). Push and Stretch As you get set up for your pullout, rotate onto your stomach by turning in a corkscrew motion as you push off the wall. Your legs should be squeezed together with your toes pointed. 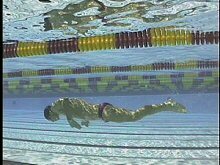 Make sure to exhale as you streamline, so that you do not float to the surface before you are ready to make your breakout. 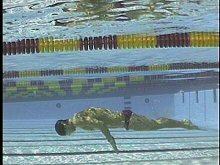 Be sure not to hold your streamline so long that your body begins to lose momentum and slow down (Photos #7 and Streamline). 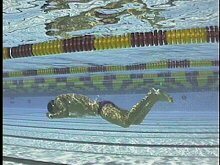 The arm motion of the pullout can be described as an exaggerated butterfly stroke: the pull and press of the arm strokes are very similar motions. Begin to sweep your hands out with the palms pitched slightly outward and upward so that the hands are outside the shoulders. Once your hands are outside the shoulders, the palms of the hands will begin to face backward. This motion is primarily a stretch to get your hands into the correct position for the next catch of the pull (Photos #8 and #9). Flex and bend your elbows nearly 90 degrees until your hands nearly come together under your chest. Then press the water under your body from the point at which your hands pass under your chest until they pass by your navel, accelerating your hands as they go through the pull. Throughout most of this phase, your hands will be close together, with your thumbs and index fingers forming a diamond pattern (Photo #10). The final phase of the pull is the upsweep, where your hands push out from under your body to push slightly upward. Your hands will stop against your thighs, with your fingers pointed down your leg. This final part of the pull should be the fastest your hands will move during the pullout. During the momentary glide, shrug your shoulders and squeeze your arms close to your sides (Photo #11). The closer you can recover your hands and forearms to the body, the less drag you will encounter. Flex your elbows enough that your arms move forward with your hands almost sliding across your body. As your arms are passing under your stomach, your feet should begin to recover by bending your knees slightly. Your feet should recover very gently so as not to cause too much drag (Photos #12 and #13). Use the propulsive phase of the kick to finish the recovery of the arms. Your body should be close to the surface, and as soon as your arms are back up into a streamline, they should begin to press outward to begin the first breaststroke pull. 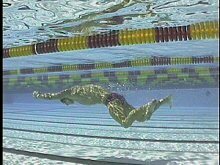 Your eyes should always be looking down throughout the entire pullout, from streamline to breakout. You will only begin to raise your eyes during the first breath of the first stroke cycle of breaststroke (Photos #14 and Breakout).